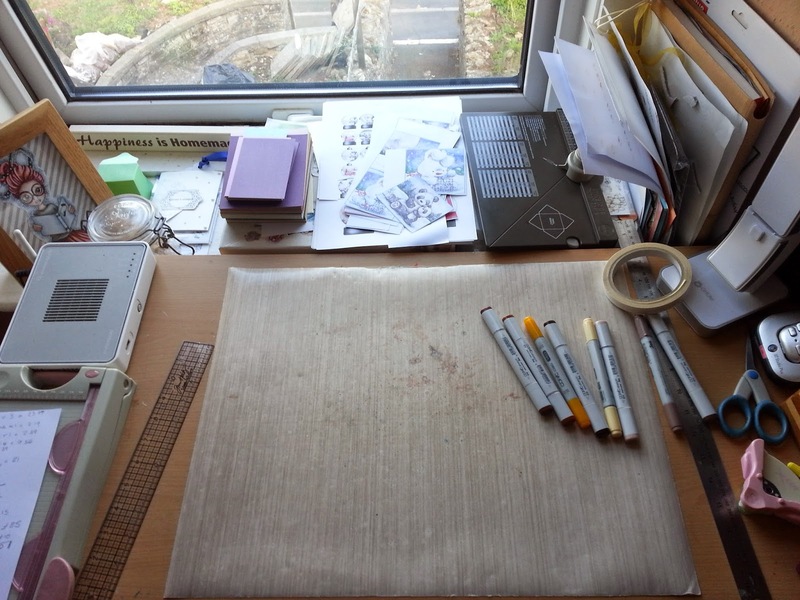 It's Wednesday and that means you need to be popping over to Julia's Stamping ground to find out about the desk dashing that most of us aspire to do weekly. So here it is in-situ. I stood behind the door to take this. The desk that had the laptop on now has the printer on it. The laptop sits on the bureau when in use but I shut it down and put it on the printer so that I can shut the bureau each night or when I want to write or do something other than use puter! My pen desk - yes that tower of pen storage is higher. I bought some new colours and wanted to keep the storage in colour sections. Window side empty-ish! There are Christmas related toppers in the window. I plan on making up the odd card in between doing stuff. 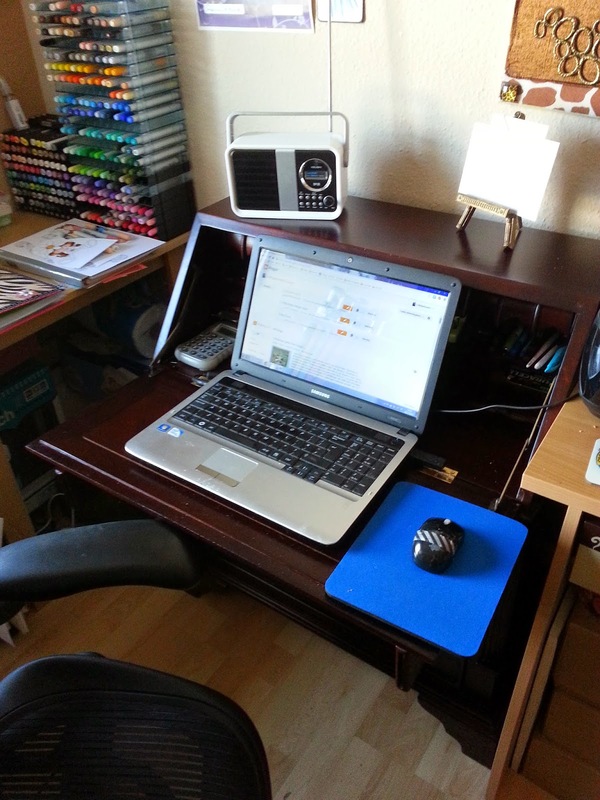 I so love your writing desk zo! And it great you are using it, I have one almost the same that was my dads, but I don't use it and I know I should. Just cannt decide what to store in it and how to use it! Love how organized your "tower of colour" is. and what a pretty desk! Beats the utilitarian office furniture all to hell! A bit of self promotion is in order Zoe, if you ask me, you're way too modest! 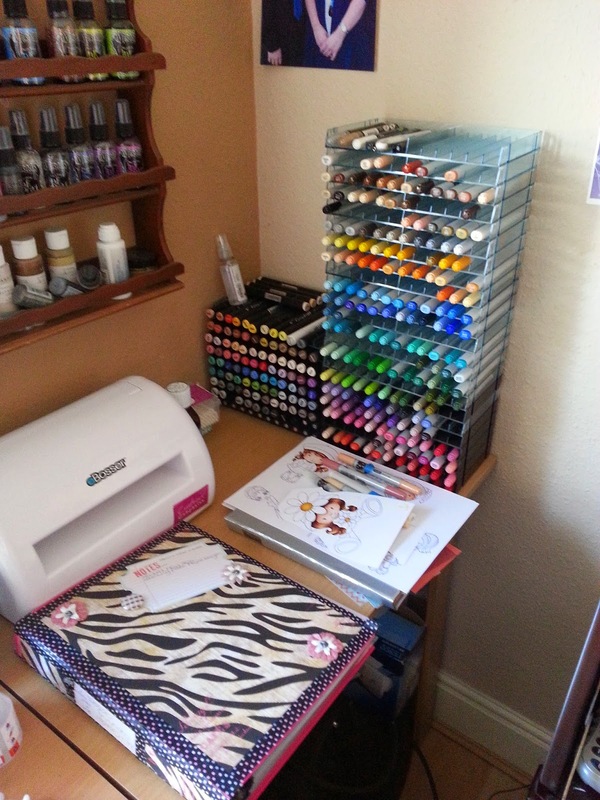 Bureau looks right at home I must say..and you pen storage is looking like an artist display! Gosh you have some pens there. I am sadly lacking in Copics but the ones I have I love and use. I can usually manage by just deepening the colour. The desk is just perfect for that space! Don't you love finding that piece that you've been looking for and just having it work! hope you are well love. I'm liking the bureau - how very proper it all is - and agree how it looks so much better than a regular desk - I suppose it gives you more room to breath when it's all closed up too?! And way to go with the sewing...yay!! Really proud if you. Let's face it, I hadn't sewn before three years ago and if I can do it, you can!!! I thought that tower of markers looked taller! I love the bureau in its new home. It is a gorgeous piece of furniture and so useful too! 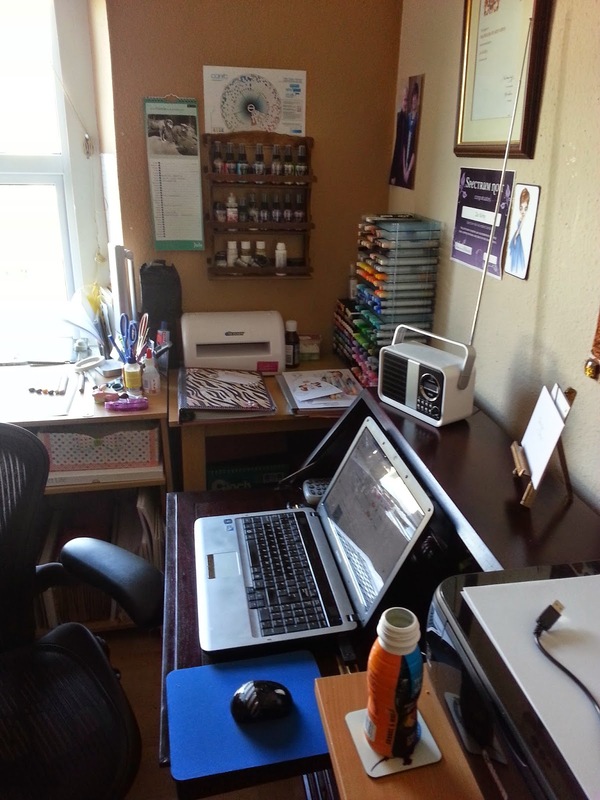 The rest of your crafty area is looking good too, plenty of room to play and some things to play with. 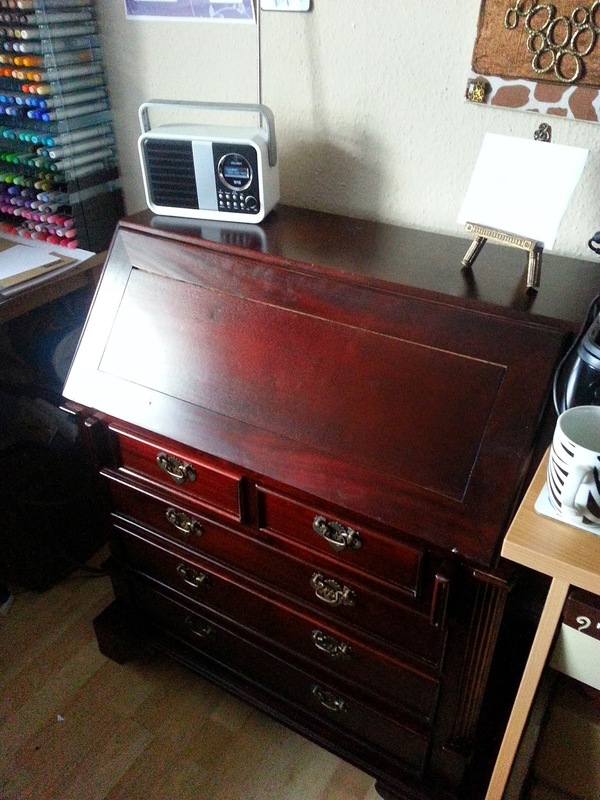 Your bureau is gorgeous, Zoe and fits in your room perfectly. It looks like you can just turn round from your craft desk to your laptop. I wish I had such an organised crafty space. Thanks for visiting already. We are keeping up with the tdf now its gone back to France and are learning all the ins and outs, never having watched it before, lol. I love the desk too. Very useful and you can shut it up when not in use, hide everything away Lol! Oh your new desk looks perfect where it is and to use if for your puter is brilliant, they are suited for each other. Love that tower of pens I thought it had grown and please to see you admitted it, you see you can't hide anything from us spying desker's. Have a great crafting week. Sensational!! your cherry desk is to die for! : ) Love all the colors in your space. Makes me happy just looking at it! you are goi.g to need a ladder soon if you get any more pens.